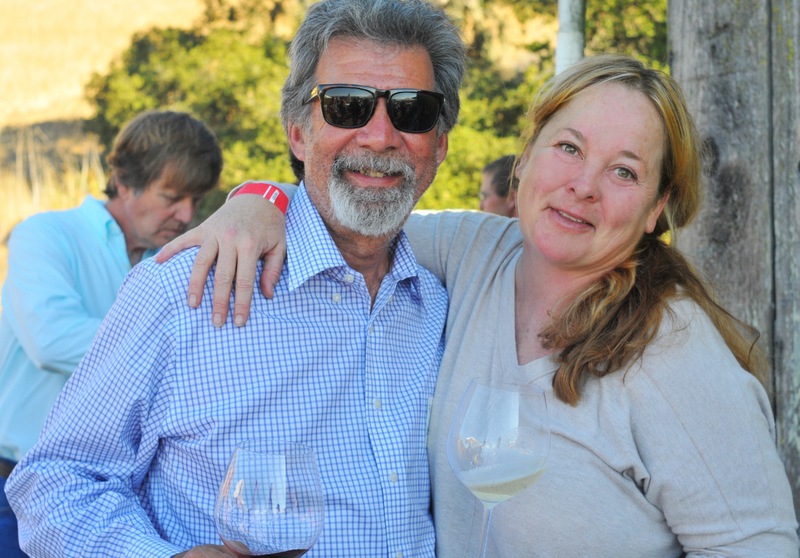 Winemakers Rick Longoria and Kris Curran at Friday evening’s Barn Party. Behind them is winemaker Norm Yost. Another Wine and Fire weekend has come and gone. 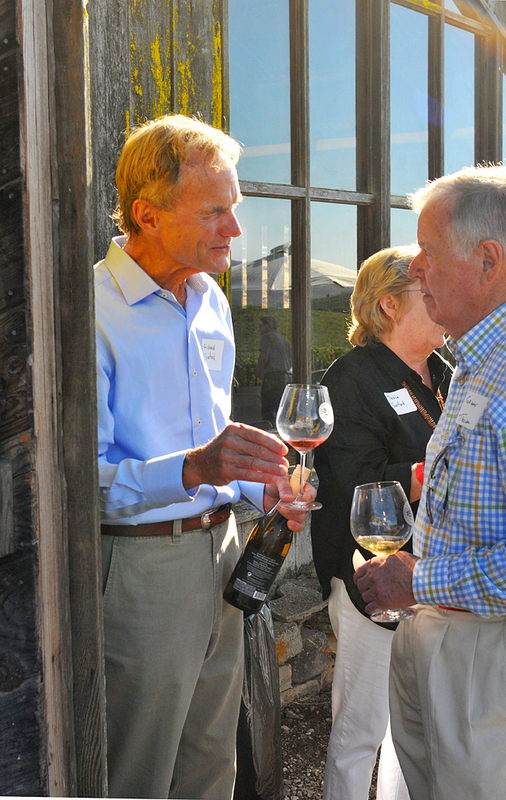 The sell-out crowds sipped and savored new and favorite wines, and listened and learned about soil, climate and grape vines growing in the Sta. Rita Hills from the producers who make the wines. Warm weather and no fog Friday evening accentuated the carpet of green vineyards lining the diatomaceous-earth hillsides across from Sanford & Benedict Vineyard’s hilltop barn, site of Friday’s soiree. This year was Wine & Fire’s second using the Barn for Friday’s gathering, and the location is breathtaking — especially early in the evening, as the setting sun infuses the air with gold. Winemakers walked among guests, pouring both current and library releases. Saturday saw the return of Wine & Fire’s annual seminar to another barn — this one at Kathy Joseph’s Fiddlestix Vineyard, just west of Sanford & Benedict across Santa Rosa Road. Moderator Josh Raynolds of Stephen Tanzer’s International Wine Cellar returned for a fourth year to moderate a two-part panel, “The Dirty Truth,” featuring four chardonnays, four pinot noirs (two each section) and their respective winemakers, and a look at the farming methods each practice. In addition to being early, the current crop is a large one — and for the third year running, Newton noted. That in itself is unusual, for two record-high tonnage years (2012 and 2013) have typically been followed by a year with lighter yields. “This one is a very unique growing year,” he added. “We didn’t know how large 2014 was until about three weeks ago, when the berries sized up,” Newton said. Many of the vineyards his company works have had to do “lots of thinning” to reduce the per-acre crop load and to drop any clusters not evenly ripening. All of the winemakers participating Saturday noted that they farm sustainable, with several certified “Sustainable in Practice,” or SIP Certified. None are certified organic or biodynamic, although Newton noted that other vineyards in his portfolio utilize those methods. Editor’s Note: Welcome to what I hope will be a weekly posting of events, news about the Central Coast wine industry and the people behind the wine. The resurgence of sparkling wine consumption has inspired the nation’s first and only dedicated sparkling wine festival. BubblyFest by the Sea will take place in the scenic, seaside town of Pismo Beach Oct. 24 to 26, highlighting more than 40 domestic and international producers of “bubbly” in a weekend-long festival. The festival kicks off from 6 to 8 p.m. on Friday with a Gatsby-themed Cocktail Mixer at the Dolphin Bay Resort & Spa. Gatsby-themed attire is encouraged. Unique Champagne cocktails will be paired with gourmet appetizers, the sounds of jazz band The Tipsy Gypsies, and stunning cliff-side views of the Pacific Ocean (Cost: $60 per person). The BUBBLYFEST Grand Tasting will take place from noon to 4 p.m. Saturday at the SeaCrest OceanFront Hotel, where guests sample pours from more than 40 local, domestic and international producers of Champagne and sparkling wine. Also featured will be gourmet samplings of artisan cheeses, chocolates, oysters, bread and other bites, as well as sparkling cocktail concoctions and musical entertainment. (Cost: $65 per person). Finally, on Sunday, BUBBLYFEST will return to Dolphin Bay Resort & Spa for a Sunday Funday Champagne brunch from 10 a.m. to noon. Staged on the ocean-side patio of the resort’s Lido Restaurant, the event will feature a three-course gourmet brunch prepared by Chef Jacob Moss, paired with bottomless Champagne. The Dan Curio of Moonshiner Collective will provide live music to complete the light-and-fun ambiance (Cost: $45 per person). For more information and tickets, visit www.bubblyfest.com. The Far Western Tavern in Old Town Orcutt has earned the prestigious “2014 Award of Excellence” from Wine Spectator magazine, an honor reserved for select restaurants with exemplary wine lists. The complete results will be published in the Aug. 31 annual restaurant issue of the Wine Spectator. “We are thrilled to bring the Wine Spectator’s Award of Excellence to the Santa Maria Valley,” said Benjamin Chanler-Laurin, general manager and sommelier of the Far Western Tavern. The Far Western Tavern was determined to take its wine list to the next level, with active input and support from restaurant co-owners, he explained. “We really started to emphasize chardonnay, pinot noir and Rhône varietals — wines that excel in the Santa Maria Valley and across the Central Coast,” he said. (Editor’s note: Bien Nacido Vineyard held its 40th Anniversary Winemaker Dinner May 29 at Far Western, and the Miller Family graciously included me. I found the meal and wines paired with the five courses to be exquisite, in particular, the oak grilled Scottish salmon with hazelnut risotto and pan seared duck breast with grilled fennel and braised beets. The first and second courses each included three wines, and the others at least one. Besides, seated at my table were local winemaking legends Bob Lindquist, Jim Clendenen, James Ontiveros, Joshua Clapper and Trey Fletcher, making the evening one for the books). California’s wine type grape production is forecast at 3.9 million tons for 2014, down 8 percent from 2013, according to a report issued Aug. 13 by the California Agricultural Statistics Service. However, 3.9 million tons is still a sizable crop, and if estimates hold true, 2014 will be California’s third-largest ever wine-grape crop to date. The raisin crop is expected to be 1.95 million tons, down 13 percent from 2014, and table grape production is forecast at 1.20 million tons, down 2 percent. The forecast is in line with Allied Grapegrowers’ earlier estimate of 3.8 to 4.0 million tons of wine grapes in 2014, though Allied president Nat Dibuduo said he thinks the state’s forecast for Thomson grapes may be high — with the Thompson crop down by as much as 20 or even 25 percent. Send submissions for “The Business of Wine” to laurie@centralcoastwinepress.com, or winecountrywriter@gmail.com. The always popular Wine and Fire returns to the Sta. Rita Hills Friday through Sunday, Aug. 15, 16 and 17, with a Paulee-style celebration of wine and food Friday at the historic Sanford Barn, high above the historic Sanford & Benedict Vineyard, as well as a seminar, grand tasting Saturday evening at La Purisima Mission and special tastings and events hosted by members of the Sta. Rita Hills Winegrowers Alliance. The seminar is already sold out, but some tickets remain available for both Friday’s barn dinner and the grand tasting, Barbara Satterfield, SRHWGA executive director, said Thursday. Friday’s attendees are welcome to bring a bottle of favorite wine to share on the collective wine table, or enjoy the library, large format and sparkling choices from participating member winemakers. 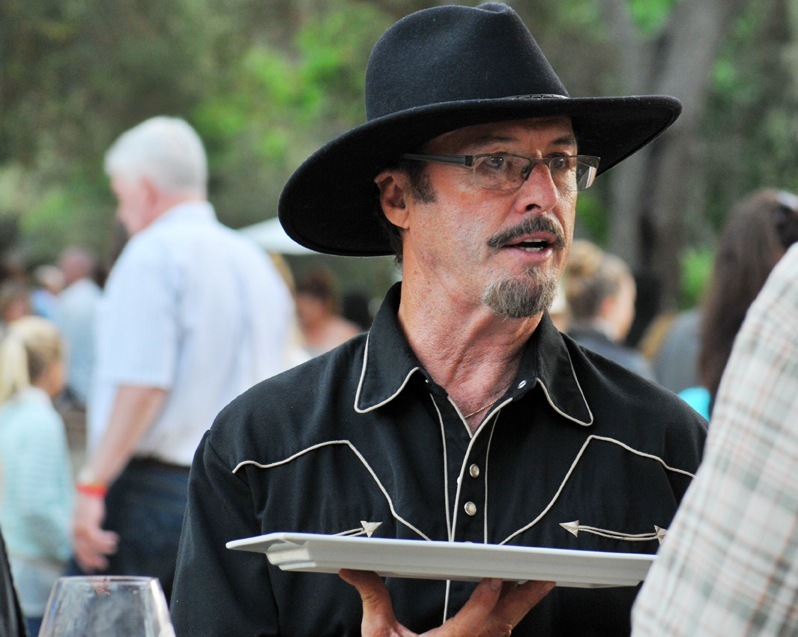 Mark Cargasacchi of Jalama Wines will pour his 2011 “Carg” Pinot Noir, and the 2011 Chardonnay from Quasi Santo Vineyard, produced under his second label, Joseph Blair, both Friday and Saturday. New West Catering will prepare fire-grilled pizzas for Friday’s event. Saturday morning’s seminar, “The Dirty Truth,” is scheduled from 10 a.m. to 2 p.m. at Fiddlestix Vineyard on Santa Rosa Road. The two-hour seminar will be led by Josh Raynolds of Stephen Tanzer’s International Wine Cellar, and will feature Santa Barbara County’s viticulturist extraordinaire, Jeff Newton of Coastal Vineyard Care Associates. Newton, who with his team manages hundreds of acres of vineyards throughout Santa Barbara County, will discuss various farming practices for vineyards, among them sustainable, organic and biodynamic. “In theory, participants will be able to “taste” the different farming practices,” said winemaker Jake Lindley, one of the panelists and the winemaker and co-owner with his wife, Frankie, of Lindley Wines. Panelists include Greg Brewer, Brewer-Clifton; Wes Hagen, Clos Pepe; Joey Gummere, Transcendence; Kathy Joseph, Fiddlehead Cellars; Dan Kessler, Kessler-Haak; Aaron Walker, Pali Wine Co.; Lindley; and Mark Horvath, Crawford Family Wines. 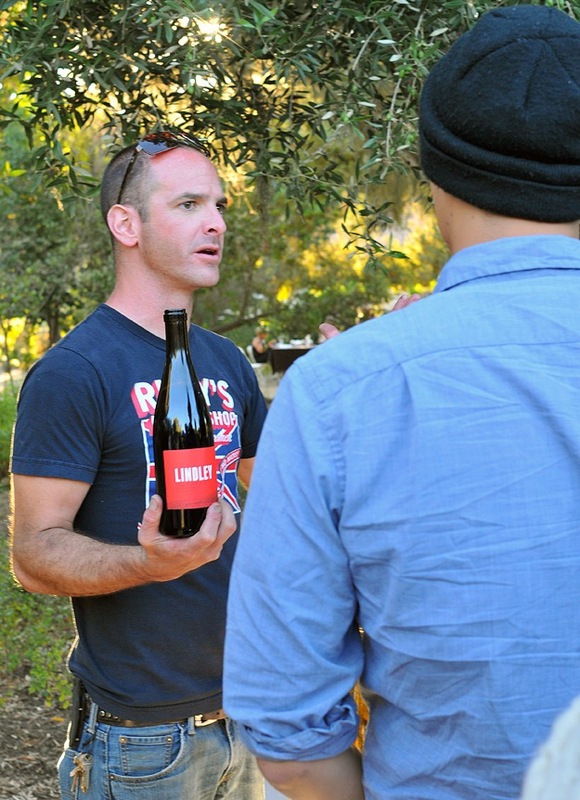 This will be Lindley’s second year pouring wine at Wine and Fire; last year’s event was one of the first times he and Frankie showed their wines during a public tasting. “Last year, I poured my first vintage ever — my baby, the 2011 pinot noir — and people were saying, ‘this wine is so good’,” Lindley told me Thursday. The Lindleys are down to less than five cases of the 2011 pinot noir, and “I hope to sell through that during Wine and Fire,” he noted. 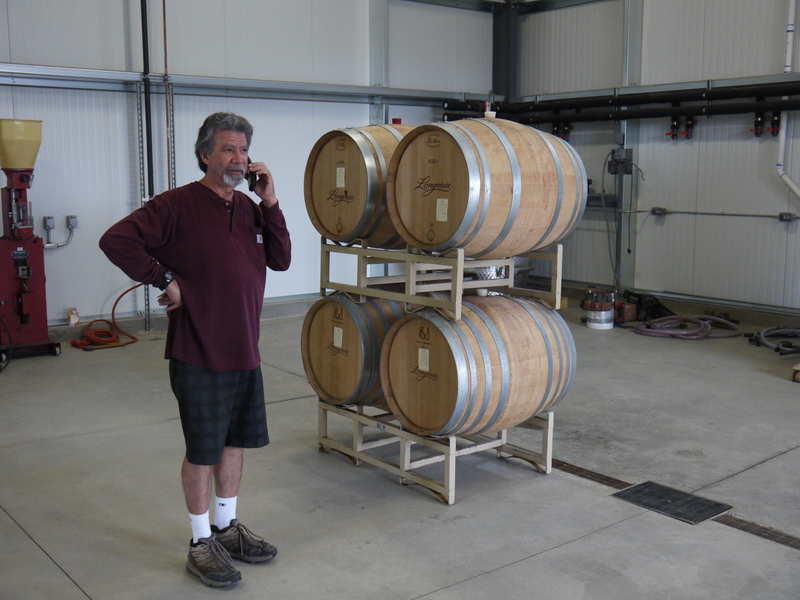 In addition to the 2011, Lindley plans to pour his 2012 pinot noir, also from La Lomita Vineyard, as well as the 2012 Viognier. During the seminar, winemakers and sommeliers will team to lead participants through a blind tasting of various Sta. Rita Hills wines. Lunch will be catered by Buellton’s Hitching Post II restaurant. 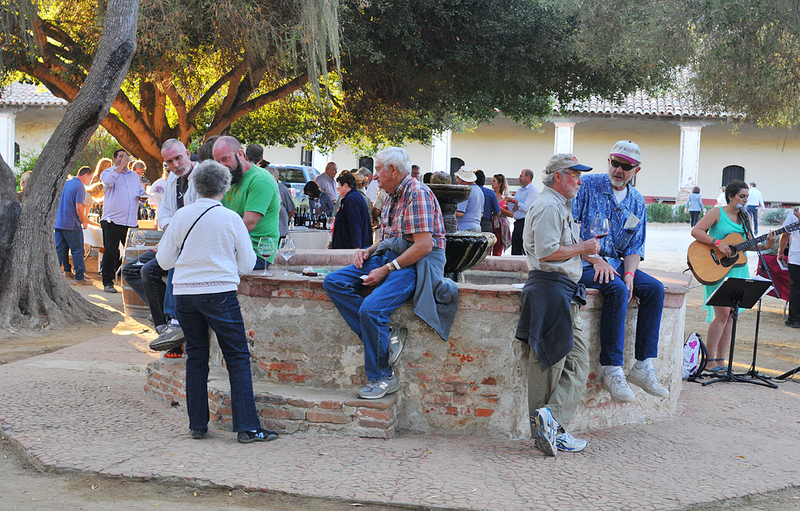 Saturday evening’s Grand Tasting will once again be held at the rustic La Purisima Mission near Lompoc. More than 40 wineries and winemakers will pour alongside local chefs, whose grilling skills are the “fire” in Wine and Fire. Chefs and restaurants include Avant, Babe Farms, Campbell Farms, Central Coast Specialty Foods, Homegrown Cowboy, J & D Stone Oven Pizza, The Hitching Post II, Los Amigos BBQ, Succulent Cafe and Sweet Creations. The SRHWGA is comprised of 52 winemakers or growers who produce wine from grapes grown in the Sta. Rita Hills AVA. 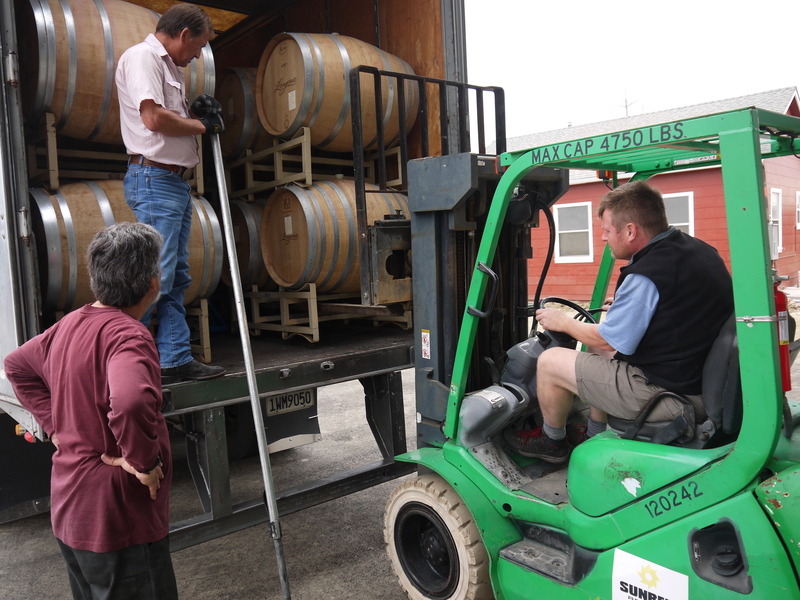 Under the watchful eye of Longoria, left, Aaron Watty, assistant winemaker, carefully unloads the first four barrels at Longoria Wines’ new Chestnut Avenue facility Thursday. Early this year, when winemaker Rick Longoria scheduled an early-August relocation from his longtime space in the Lompoc Wine Ghetto to his new winery and tasting room on East Chestnut Avenue, he thought he’d be well ahead of harvest. Mother Nature, however, holds the cards. All of them. A warm growing season has hastened the maturation of many grapes, white and red, with the chardonnay and pinot noirs destined for local sparkling wines under harvest as early as the first days of August. He ended up with his first fruit — from Rita’s Crowne — later on Thursday, according to Diana Longoria Friday. Throughout the day and into the evening Thursday, the Longoria’s Ghetto winery site was gradually cleared and barrels restocked in the new facility on Chestnut. Seven 18-wheeler truckloads later, all the barrels had been moved, and the stainless steel tanks were transported via one load on an open flatbed, said Aaron Watty, assistant winemaker at Longoria.